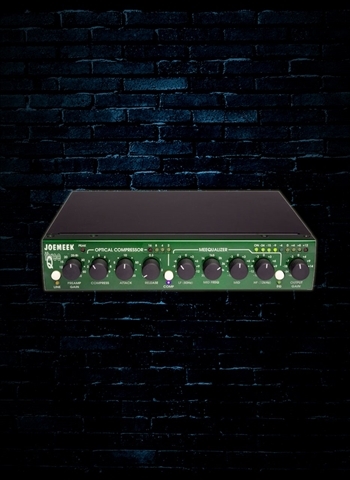 The Joemeek threeQ is the perfect link between your music and your computer. It will bring out the best qualities or your music by giving it the "gloss" of a professional recording studio, at a fraction of the cost! Built into a compact 1/2 rack chassis, we used the same Burr-Brown IC's for the Mic Pre that you'll find on our more expensive studio channels. We then added an extremely musical EQ section and an optical Compressor, for that signature "Meek" sound. With inputs to accept everything between microphone and instrument levels, the threeQ sounds much larger than it's size!